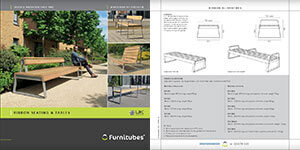 The principle of both the original Ribbon and the XL versions is the same - a minimal number of seat support components and timber section profiles that can be combined to give many different bench and seat assembly types. Simply changing the timber slat lengths means a wide range of coordinated seating products can be used on a single scheme, from single seaters up to four-person units. Ribbon and Ribbon XL offers the specifier coordinated designs suitable for a variety of schemes, appropriately styled for prestigious new developments yet economic enough for ‘everyday’ sites. In addition to conventional seating configurations, Ribbon also offers the unusual form of the ‘Multiseat’ - which can be used as two-tier seating or a seat and table surface - and the new Ribbon XL recliner is a high-back twin seat for more laid-back seating situations. With a 720mm deep seating surface the Ribbon XL bench is much larger than most conventional benches, allowing it to be used as perch seating from both sides at the same time, so potentially doubling the seating capacity when fully occupied. Without armrests the bench is effectively a large uninterrupted seating platform that can be approached and sat on from any side. Armrests are offered as integral features to steel platform supports or as add-on features fixed to the timber seating platform. The Ribbon XL seat is simply the XL bench with the addition of a low backrest, inset from the ends of the seating platform. The backrest comprises three timber slats - on the top, front and back - all discretely fixed to steel supports, making the seat look as good from all directions. 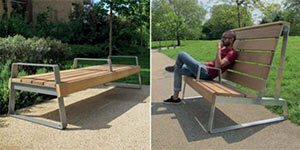 The height of the backrest top slat also allows it to be used informally as a perch seat from the rear. Various seat lengths are available as standard, accommodating from one to four people. The Ribbon XL recliner is a unique new addition to the range, designed for use in relaxed environments such as parks and gardens. The sloped seating surface and high back allow users to comfortably lean back and take in the surroundings or to simply enjoy the sunshine. The recliner is available as a two-seater seating unit, with the central armrest designed to assist users in getting off the seat. As with other XL range products, the recliner can be used freestanding on suitable sites.